Suitable for: Interest level suitable for Years 2-6 (P3-7) (ages 6-11). Yellow-Gold book bands. Letters and Sounds Phases 3-5. The only reading intervention to embed systematic synthetic phonics within a highly motivational adventure series. A different type of reading book built for today's children, starring the Project X characters in a gripping new 3D adventure series. 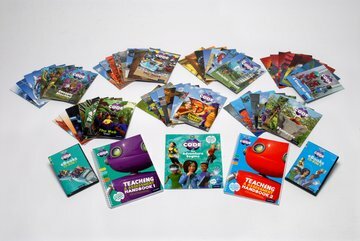 Two texts within every book drive the story forward: the first text is 100% decodable to build reading confidence; the second at least 80% decodable to draw children through the series and keep them motivated. A phonic progression specifically built for struggling readers which revisits prior learning and strengthens phonic knowledge and skills. Fully resourced with comprehensive lesson plans, easy-to-use assessment and progress tracking, plus online PD support for teachers and TAs, all designed to accelerate progress.